The PAC-LINE™ is a medium capacity, enclosed track, chain conveyor designed for maximum conveying flexibility in small spaces. 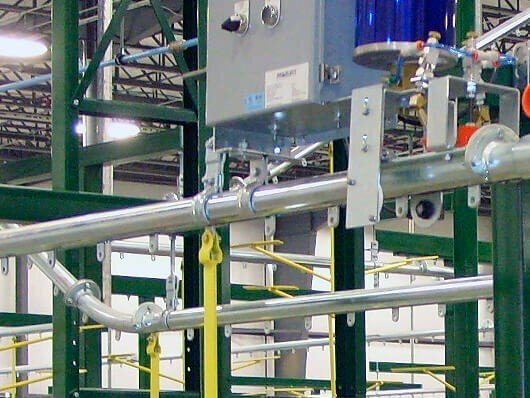 This conveyor system is best suited for “slot down” applications where the load is beneath the conveyor track. PACLINE’s Power and Free conveyors are enclosed track chain conveyors developed to provide asynchronous conveying. 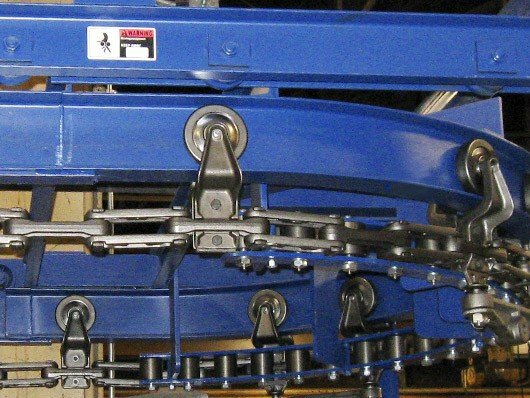 This dual track system allows for each load-carrying trolley set to stop and start independently from the powered chain and to move the loads at different speeds. The PAC-MAX™ is a heavy-duty enclosed track conveyor that features a unique cross “+” shaped track for exceptional load stability. This conveyor can be inverted or rotated sideways as an excellent alternative to the typical spindle conveyors for long paint lines. PACLINE is a licensed distributor / integrator for Jervis B. Webb Unibilt® conveyors. 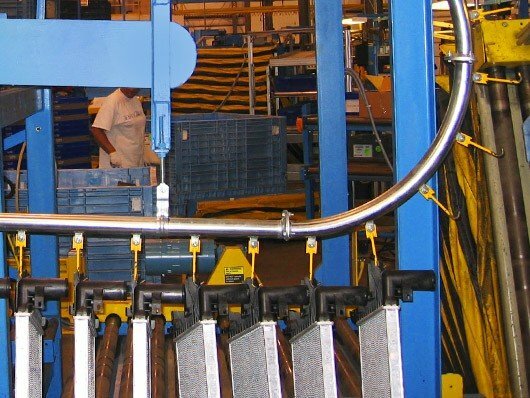 The Unibilt® conveyor systems are well suited for medium duty conveyor applications such as paint lines, assembly lines and parts storage. The Unibilt® conveyor products offered are Square Enclosed Track, Power & Free, Over and Under, and Wide-Trak™ conveyors. To convey heavy loads cost effectively consider the ‘tried and true’ I-Beam conveyor from PACLINE. With heavy duty forged chain and trolleys, the PAC-BEAM™ is available in 3”, 4” and 6” track heights. 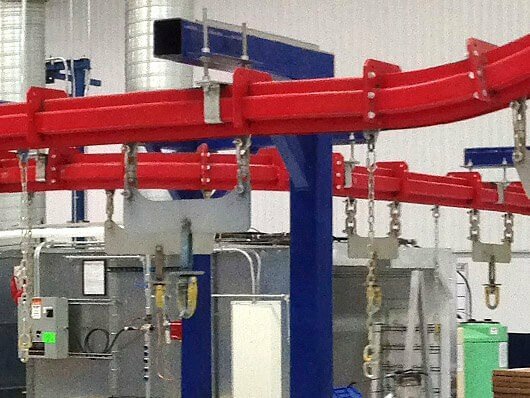 We offer a full line of customized I-beam trolley assemblies and attachments. 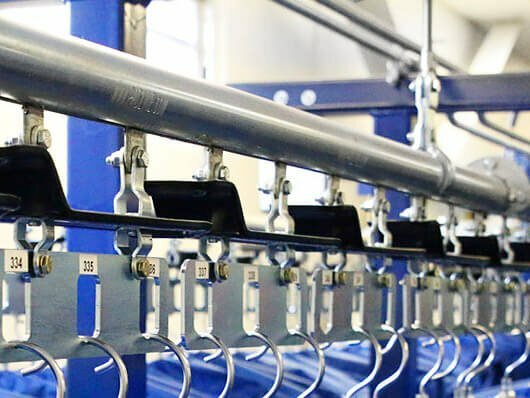 The compact, modular design of the PACLINE™ Garment conveyor system allows for a variety of configurations to suit your specific garment handling application. The enclosed track design eliminates dangerous pinch points common in other conveyor designs. 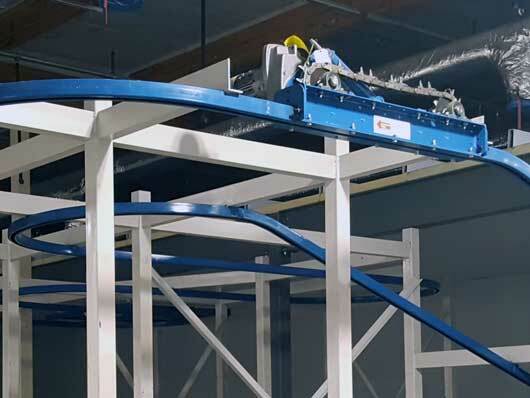 PACLINE offers a variety of towline floor conveyors. 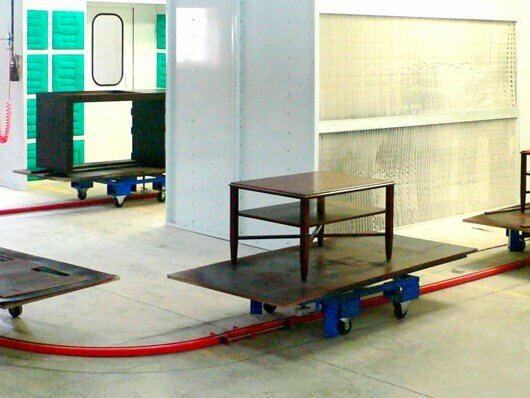 This dolly or 4-wheeled cart system is built with custom top platens, designed to hold, rotate, and convey large or awkward shaped items through paint lines or assembly line processes. 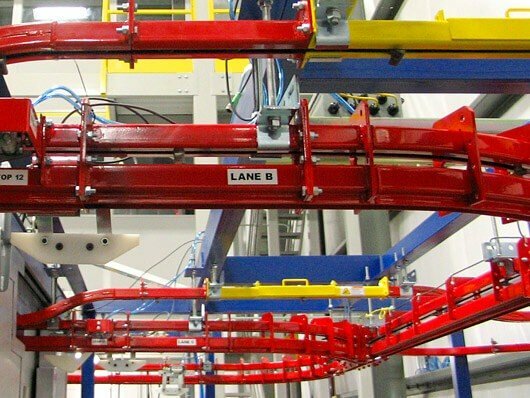 For parts accumulation and storage applications, PACLINE has developed a cost effective, non-powered, gravity rail system. 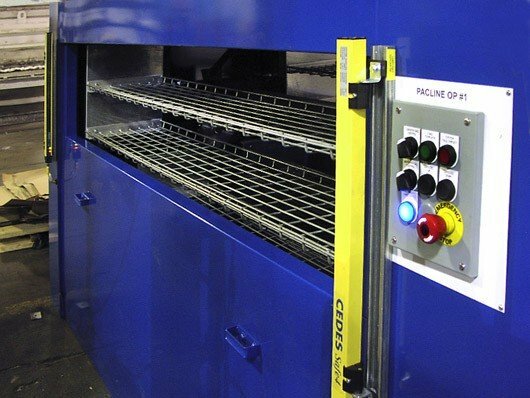 Consider the Over Under design for a simple load and unload parts buffer and delivery solution. The PAC-RAK™ vertical carousel conveyor can create space efficient, high-density storage and enhanced cube utilization in various manufacturing, warehouse and retail store applications. 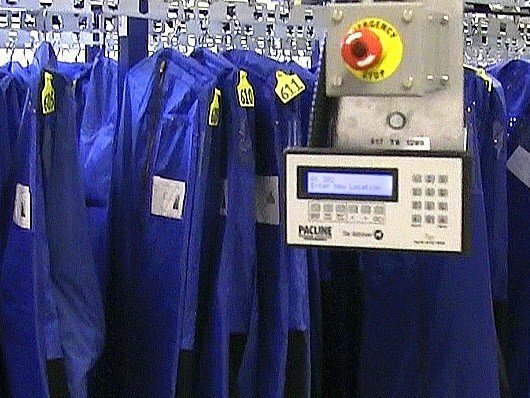 The Pacline Retriever™ is an inexpensive control station that allows an operator to locate and retrieve any item that is hanging from the conveyor. Applications include: printing die and pattern storage, inmate property and uniform storage and retrieval. PACLINE offers superior quality overhead I-beam trolleys with low friction precision load wheels. Tolleys are adaptable to various I-beam sizes and in load ratings up to 1 ton capacity. 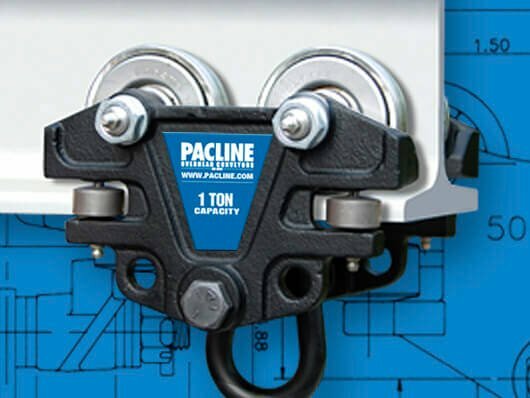 Quantities of 1-10 Pacline trolleys can be ordered directly through Amazon.com.